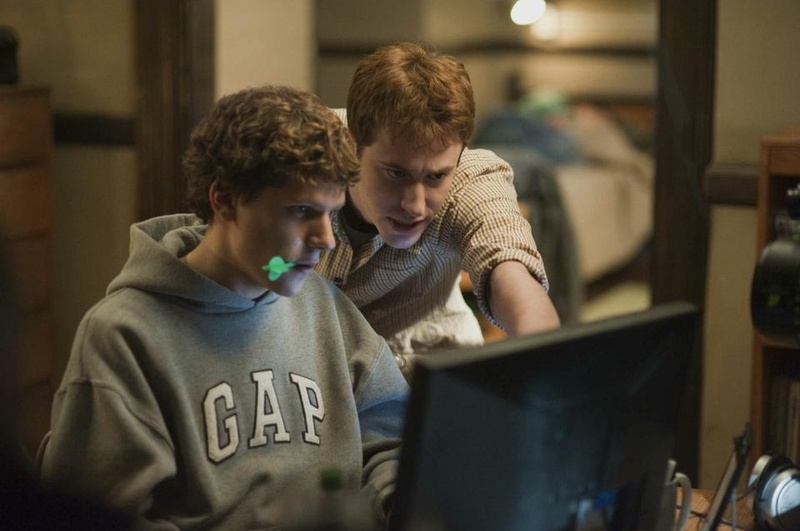 Mark E. Zuckerberg (Jesse Eisenberg) creates Facebook in his Kirkland House dorm room in "The Social Network." Fincher has made a career of capturing the intricacies and passions of the human mind in a stylistically captivating, typically bleak manner. A penetrating portrait of the brains behind Facebook, “The Social Network” fits into this oeuvre with one notable—and welcome—addition: hyper-literate screenwriter Aaron Sorkin. Together, Fincher and Sorkin have crafted a stunning modern epic—an electric and incisive film that is a timeless depiction of old against new and one man’s single-minded climb to the top, and yet remains deeply relevant to contemporary society. Fincher and Sorkin are perhaps not the most obvious pair to tackle the story of Zuckerberg’s rise to Internet ascendancy; but as a rapid-fire conversation about final clubs in a bar gives way to a darkly melancholic sequence of Zuckerberg traveling back to his Kirkland House dorm room, it becomes clear that here is an ideal creative union. Fate, coincidence, luck—whatever prompted this meeting of artistic minds behind the movie also drives the story of the film itself. Socially awkward, technologically savvy, and profoundly lonely Harvard sophomore Mark Zuckerberg (Jesse Eisenberg) sparks a cultural sensation in 2004 when he creates social networking website Facebook after three fellow students—Cameron S.H. Winklevoss ’04, Tyler O.H. Winklevoss ’04, and Divya K. Narendra ’04—ask for his help with a similar project. While Facebook becomes the phenomenon it is today, Zuckerberg breaks ties with his close friend and business manager Eduardo L. Saverin ’05 (Andrew Garfield), as Saverin can no longer keep up with the company’s growth. In the present day, the Winklevoss twins (both played by Armie Hammer, with body double Josh Pence) and Narendra (Max Minghella) press charges against Zuckerberg for copyright infringement and fraud, while Saverin sues for his role in Facebook being unfairly diminished. Although the film follows Zuckerberg most closely, he is neither its hero nor its villain. Refreshingly, heroes and villains are nowhere to be found in “The Social Network,” where everyone is at least a little wrong even as they resolutely think they are right. Narendra and the Winklevi, as Zuckerberg refers to the brothers, carelessly engage in the world of excess and exclusivity that so enraptures and yet excludes Zuckerberg. Saverin almost holds back Facebook’s success because of his lack of vision. Zuckerberg himself, of course, allegedly betrays all the rest. Yet, all five individuals stay wholly convinced that their ends are honorable. These Facebook five are brought to life vividly onscreen. Saverin is ostensibly the most virtuous of the group, but Garfield at times makes him unexpectedly—and fittingly—dark, further clouding the moral lines. Similarly, Hammer and Minghella never let their characters become the rich-kid antagonists a lesser movie might make them out to be. Hammer in particular infuses his depictions with humor and likability, which serves as a biting contrast to the twins’ later embitterment. Yet above all, this movie belongs to Eisenberg, and his nuanced portrayal of the man behind Facebook stuns. His fast-talking and anxious teenaged Zuckerberg at the beginning of the film believably and subtly turns into the impertinent and nonchalant businessman later shown at the depositions. However, Eisenberg never descends into pure malice; his Zuckerberg might be a pitiful person, but he remains pitiable. What results from these carefully shaded renderings is an illustration of the nature of truth—specifically, how any one event can yield numerous individual accounts of “what really happened.” The film’s engaging structure, which effortlessly shifts between Facebook’s creation and the later depositions, reinforces these fractured perspectives that touch on everything from loyalty and jealousy to power and status; while grounded in a battle over technology, the film explores countless universal concepts. The genius of “The Social Network,” though, lies in its specific execution of these weighty ideas. Fincher and Sorkin elevate an already compelling and sensational tale to a grand scale. The techno-operatic score by Trent Reznor and Atticus Ross forebodingly pulses throughout the movie like a synthesized heartbeat. Sorkin’s writing is characteristically sharp and witty—“I think they want to sell me a Brooks Brothers franchise,” former University President Lawrence H. Summers says of the Winklevi—but also smartly presents the disputes of these college students as epic struggles on the magnitude of a Greek tragedy. Even though anyone with an Internet connection knows roughly how the story ends, Fincher maintains the film’s tension and sense of exhilaration throughout; its continuous momentum mirrors the meteoric rise of Facebook itself. As for the place where Facebook started that ascent, Harvard fares well with an authentic onscreen representation that captures the general tone of the campus. Sorkin nails Harvard’s unique vernacular, convincingly incorporating references to House life and the broader campus experience, and the actors sound natural using these Harvardisms. Small details, like the advertisement for Drag Night on the Adams House website, help to realistically evoke the world Zuckerberg inhabited. While the door Zuckerberg swipes into to enter Kirkland might not accurately reflect the House’s actual arched brick entrance, his dorm room feels appropriately cramped and seems to be a walk-through in true Kirkland style. Although it is sometimes clear that this is not the real Harvard, it certainly feels like it. Not quite as credibly portrayed are the final clubs, Harvard’s semi-secret all-male social organizations to which Zuckerberg strives to belong—and which are suggested as a possible reason he starts Facebook. While the groups are indeed exclusive and often throw impressive parties, the pictured debauchery borders on excessive. However, when these scenes are viewed as Zuckerberg’s projections of what he misses out on by not belonging to a club, the film’s veracity stays intact. After all, final clubs are hardly presented as the objective pinnacles of Harvard’s social life; more accurately, only the Zuckerberg of the movie sees them that way. This obsession—with final clubs, then Facebook, and always status—earns Zuckerberg his place among Fincher’s motley crew of fascinating and manic antiheroes. Tyler Durden is going to have to make room for the new addition to the club—one that Zuckerberg is more than welcome to join. —Staff writer Ali R. Leskowitz can be reached at aleskow@fas.harvard.edu.